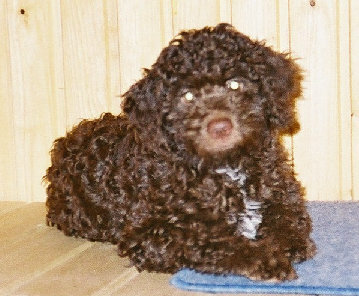 This is the sad story of my Vilma-lagotto… Punatassun Nebulosa AC, or Vilma as we used to call her, was born 7/12/2002 and passed away 7/4/2003 suffering from Cerebella Abiotrophy. They treated Vilma at The Helsinki University department of veterinary medicine. Here she also was euthanized and they did do a histopathological examination, as well. History: abnormal gait since about 3 weeks. General clinical and orthopedically examination: normal. Neurological examination: generalised ataxia, hypermetria in the front, deficits in the postrual reactions, normal reflexes, decreased menance reaction on both sides. Blood examination: normal. Magnetic reconance imaging: the cerebellum seems to be somewhat smaller as expected; hypointense areas in T2 in the white matter of the cerebellum and mesecephalon; these changes seems to be symmetrical and do not enchance after the gadolinium aplication. These lesions are isointense or even mildly hypointense in T1. Cerebrospinal fluid examination: normal. Necropsy: the cerebellum weighed about 7% of the total brain (normal 10-12%). No lesions were found in any of the brain or spinal cord parts except the cerebellum. Here there is a profound loss of the granular layer. This lesion is through all of the folia of the vermis and paravermis and the medial part of the lateral aspect of the hemisphere but the most lateral folia of the hemisphere are spared bilaterally. Histopathological diagnosis: cerebellar abiotrophy Conclusion: described degenerative cerebellar disorders in Vilma most likely have an inherited pathogenesis as it is described in other dog breeds.